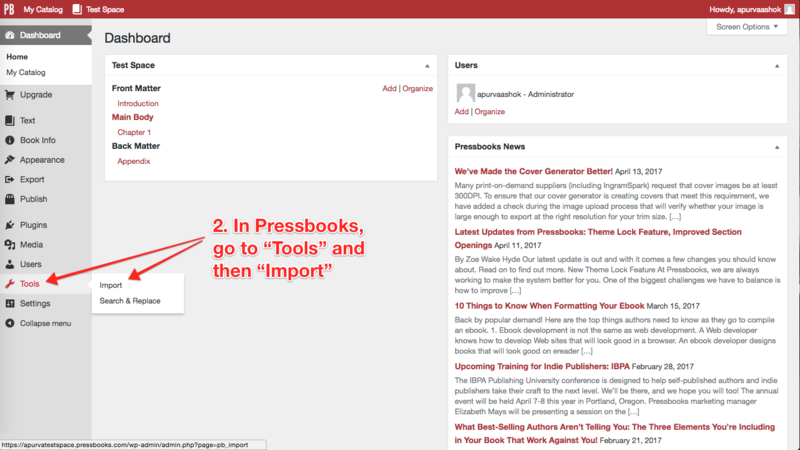 Below you’ll see how to import your manuscript using the Pressbooks docx importer. This importer will bring in all your chapters, and basic styling (italic, bold, lists, H2, H3, paragraph breaks, etc). Note that the importer will import only BASIC styling. It should not import font choices, colors, etc. The cleaner your Word file is to begin with, the less cleanup you’ll need to do to your book in Pressbooks. 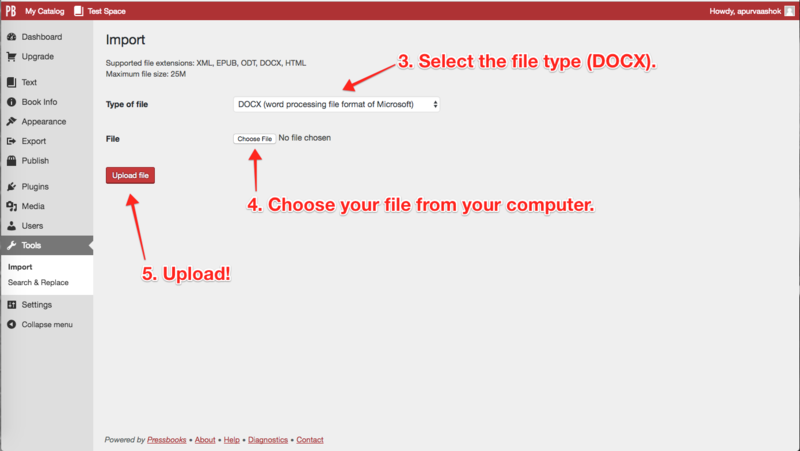 To use the MS Word importer, see instructions below, and screenshots below that. Prepare your docx file: First, using the Styles menu (not the formatting menu) in Word, make sure you apply NORMAL styling to the entire document; and apply Heading1 style to your chapter headings. In Pressbooks, go to: Left Menu/Tools —> Import. Test some exports, clean up markup, and off you go! Everything other than basic styling is stripped out _by design_ … so fancy fonts and such won’t get imported. Italics, bold etc. should. When importing, make sure that your filename doesn’t contain any special characters as this can interfere with the process. If necessary, rename your document before uploading. First: Select all your text in Word and make sure the Normal style is applied (otherwise yucky Word styling might be imported and all sorts of bad things will happen on export). 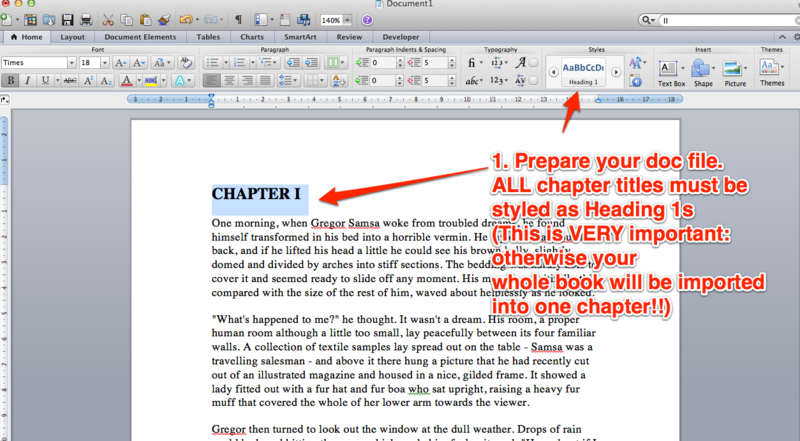 Second: Chapter headings in your docx MUST be tagged as Heading1 (otherwise chapters won’t get recognized). 2. In Pressbooks, Go to: Left Menu/Tools —> Import. 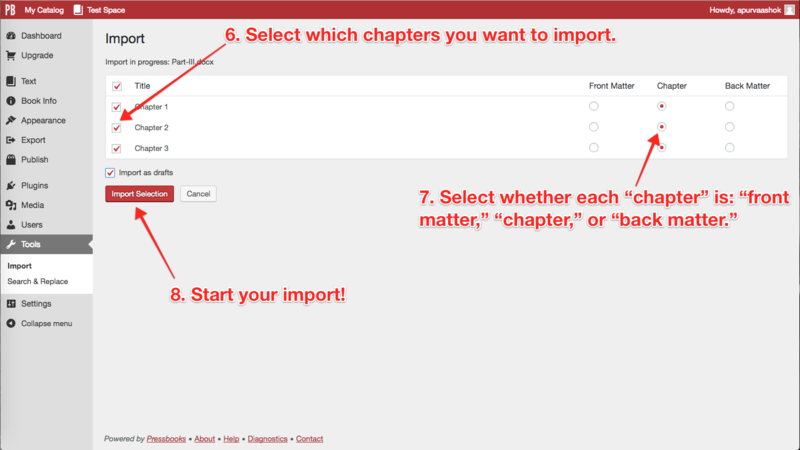 Steps 6, 7, 8: Select which chapters to import, what kind of content they are, and then Start! 9, 10: Rearrange Your Chapters (if Necessary), Check Them (!) and… Tada! Steps 9, 10: Rearrange your chaps if necessary… and off you go!